This handsome diminutive sinumbra is presented in a beautiful two-tone gilt-lacquered finish. 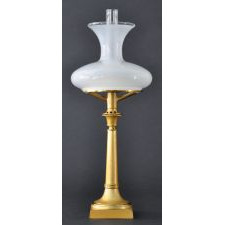 The smaller lamp size is desirable to collectors. The shade is frosted on the inside and compliments the elegant design of the sinumbra.